One time, Chris and I were standing in the checkout line at the grocery store, a basket full of groceries, when a woman stepped into line behind us. I noticed that she had a hand basket with only two or three items. Chris and I insisted that she go ahead of us. She protested and seemed really shocked that we would give up our place in line. Of course, Chris and I won out and she went ahead of us, but I couldn't help being a bit perplexed at her reaction. We see the same thing every time we give a Sonic carhop a tip. They always react as if we've given them a million dollars. Afterward, Chris and I always have the conversation of "poor carhop, no one ever tips them". The truth is, those carhops probably rarely see a tip. It's so simple, being nice and it's an easy thing to do, for the most part. I really started thinking about this when I went to this site tweeted by Chookooloonks. 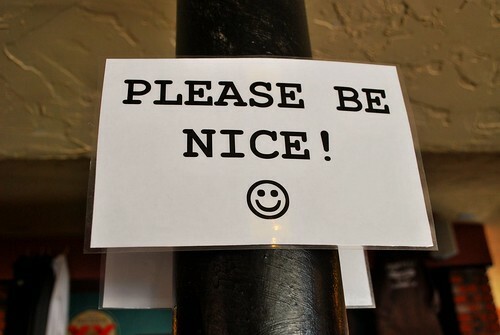 Wouldn't it be so much easier to be nice to people if they were wearing a sign like one of those? And then it dawned on me. It's easy to be nice, but some times, it's hard to accept kindness. This is something I tend to struggle with, particularly when the kindness is coming from someone I don't trust. So, today for Love Thursday, I offer you a challenge. It's a challenge to not only be nice, but to accept kindness from others.